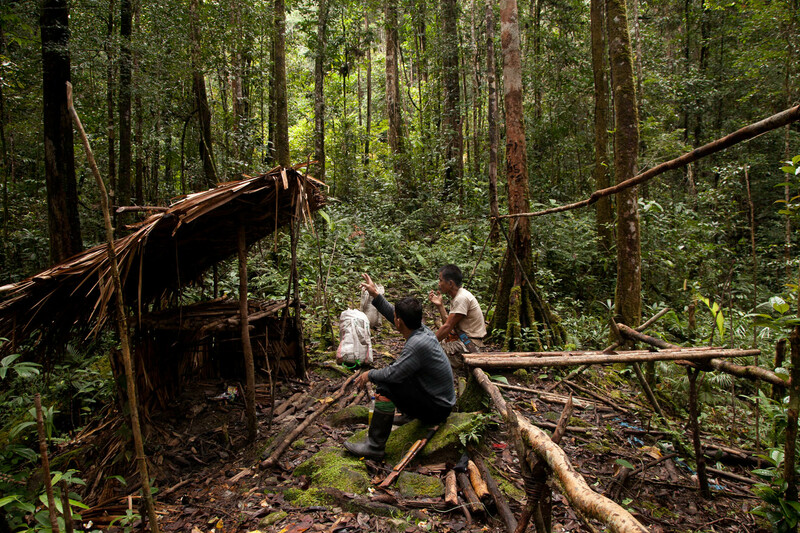 A couple of years ago I was developing a semi-commercial expedition in partnership with Falmouth University and the Heart of Borneo Project, organised through my social enterprise Beyond Exploration. 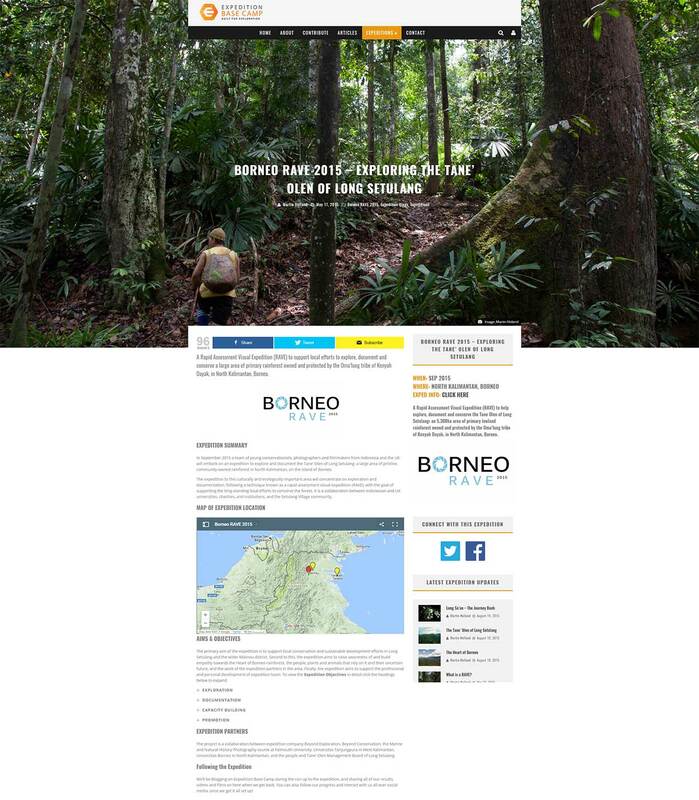 The expedition was the first Rapid Assessment Visual Expedition to Borneo – the Borneo RAVE 2015. 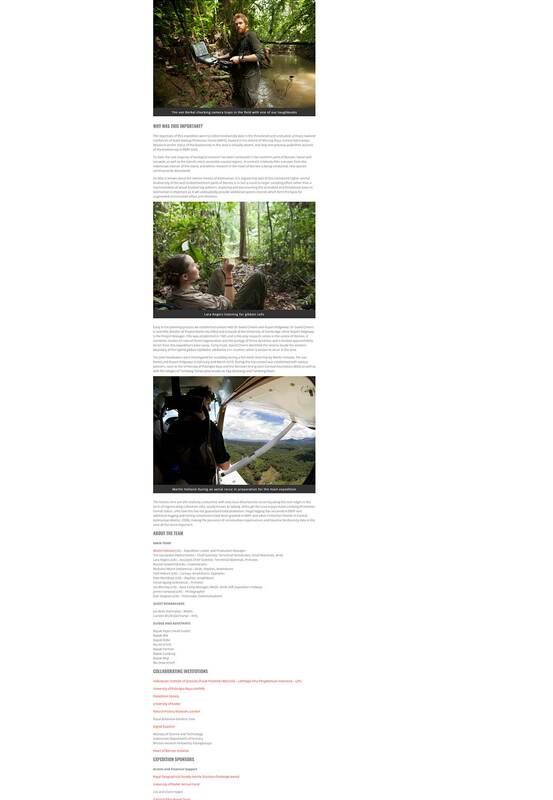 The expedition needed its own online presence: dedicated social media channels and a website to grow an audience and share the story of the expedition, which is a critical component of any expedition, but especially a RAVE. While Facebook, Twitter, Instagram and other similar platforms only take a few minutes to set up, and these audiences can be engaged long after the main event (or nudged to follow other accounts), a new website takes time and soon stops receiving visitors once the flow of new content dries up. Eventually it will stop being maintained and will die a cold and lonely death in the never regions of the world wide web. 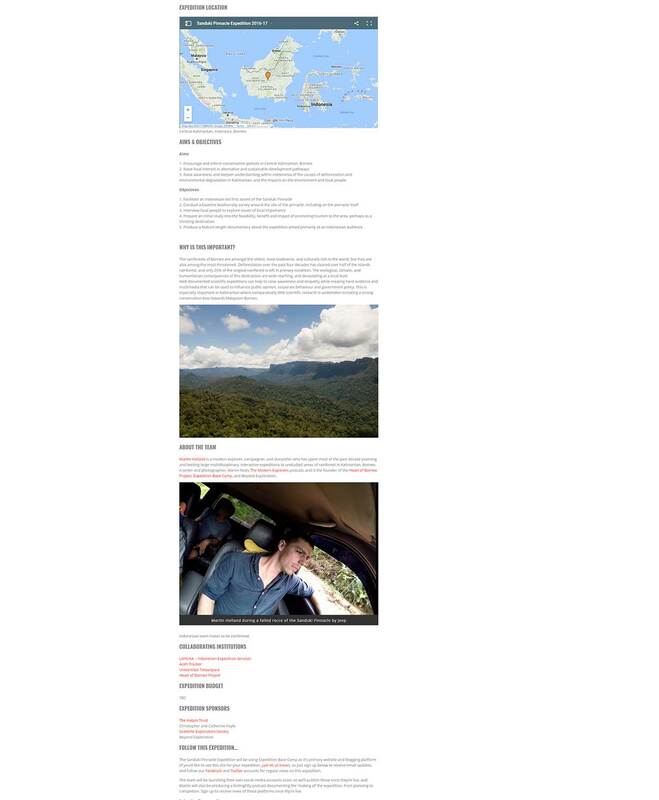 As a person with zero budget for these things I have learned to build simple websites (such as this one) myself, and the thought of spending all that time indoors on a computer creating something worthwhile only for it to be abandoned soon after the expedition had finished made me want to cry into my keyboard. What I needed was a neutral platform that could act as online host for this expedition, and other similar expeditions in future. 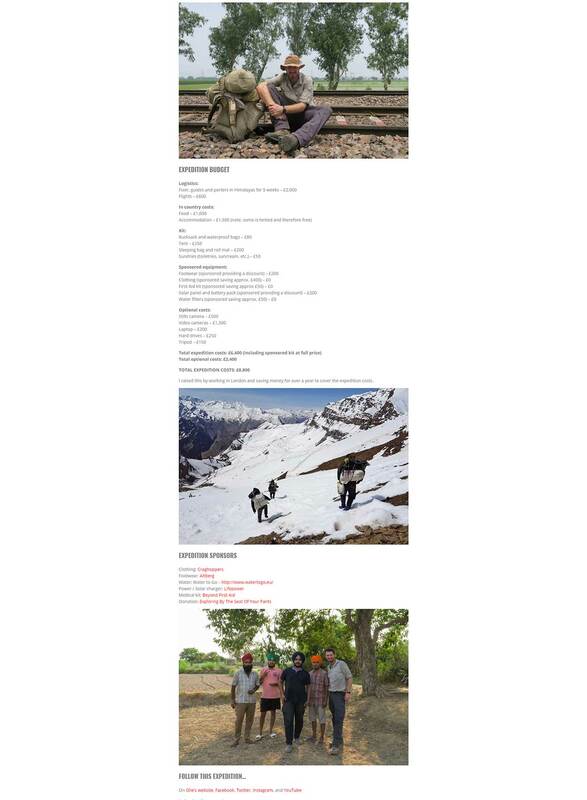 Something that would allow me to ‘brand’ the pages of this expedition without having conflicting branding that would make it seem as though the expedition was organised by or sponsored by someone else. I needed something flexible, easy to use and maintain, and beautiful. It didn’t exist, so I decided to build it. It’s called Expedition Base Camp, and it’s been a labour of love that I honestly think is going to slowly grow into the central online portal for the expedition community (I’ll define this community further down). Screenshots of the most recent addition to Expedition Base Camp, Chasing Gandhi’s Shadow, demonstrating the standard layout and thorough information included in the page. 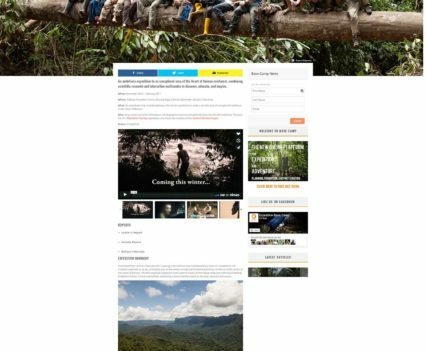 While I was building Expedition Base Camp I realised that many people were in the same position: building expedition websites on the cheap that would attract small audiences for a short period. All that work, vital to communicating your expedition results and stories with the world, to so little avail so often. What if I opened Expedition Base Camp up to the world so that anyone could use it? 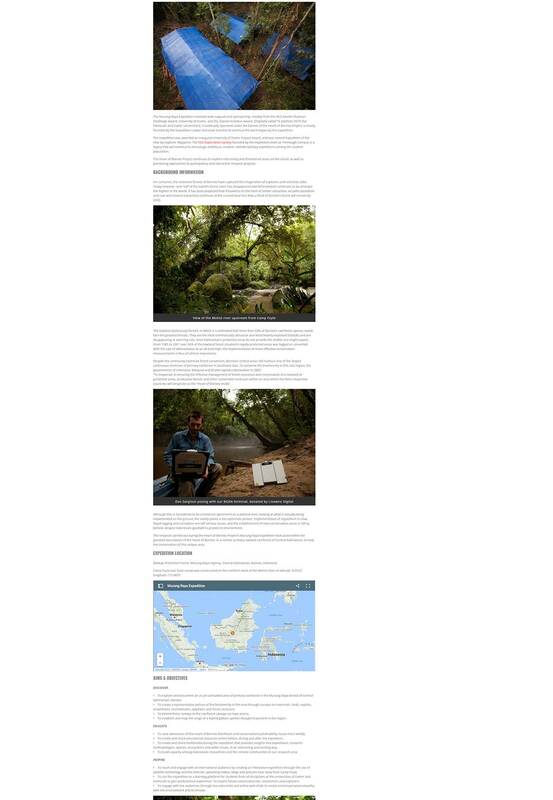 What if expedition teams that don’t need a complete website could use a standardised page on Expedition Base Camp as their website? And what if they could even blog on there? 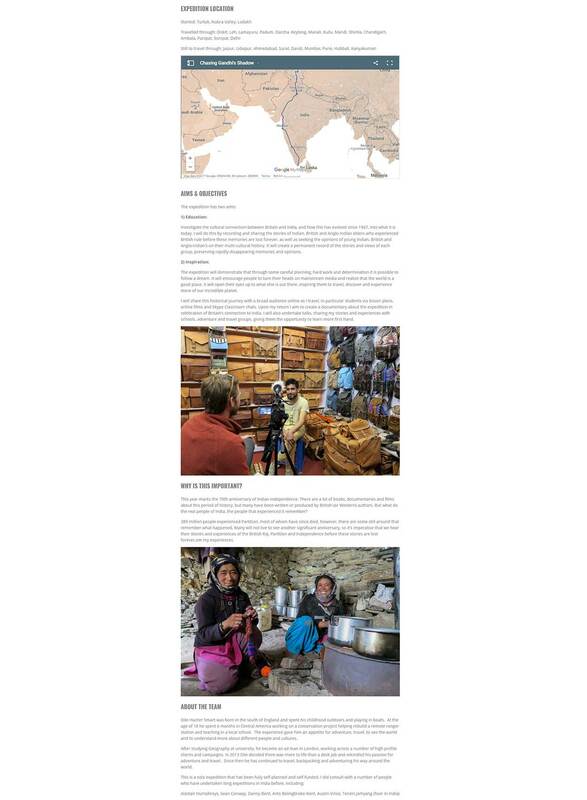 And if expedition teams had their own website, would they benefit from having a page on Expedition Base Camp as well? And if it turned out that people wanted to use it, what would the site turn into? How would I fund it? 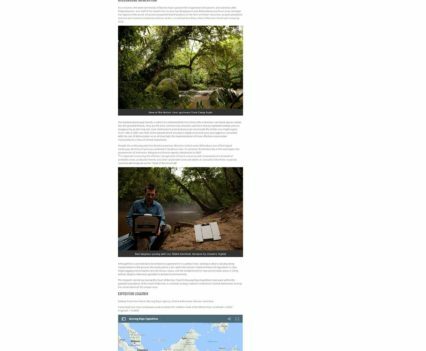 At the RGS Explore weekend last year I demonstrated the site to the audience and the response was fantastic. Since then I’ve been slowly expanding the number of teams represented, working out workflows and testing systems, and I think that now the site is ready to grow. 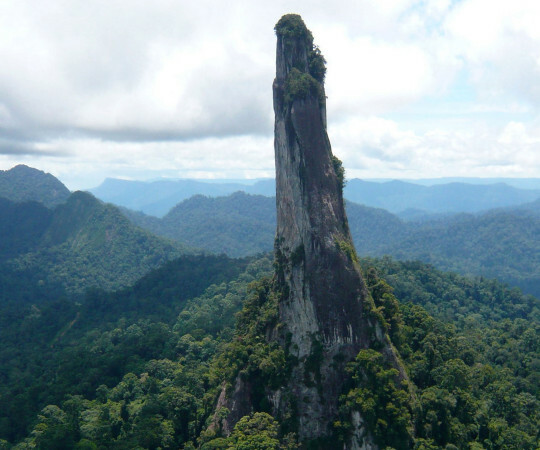 The core of the site is something like a highly visual and searchable expedition database. The RGS has the most comprehensive expedition database on the planet (and as a rule I add any new expeditions submitted to Expedition Base Camp to the RGS database to help keep it thorough) but it’s not something that a lay person is ever going to stumble upon, let alone browse. 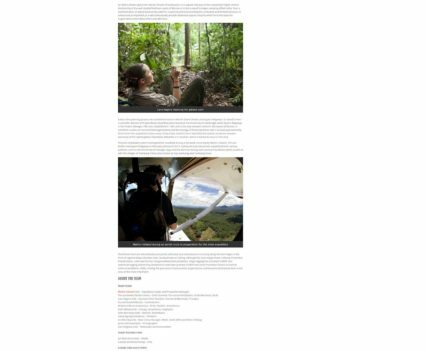 Expedition Base Camp is like a magazine-database hybrid: it’s built like a normal website so anyone can browse it, and it’s beautiful, with lots of images, maps, videos and reports embedded into each expedition page. 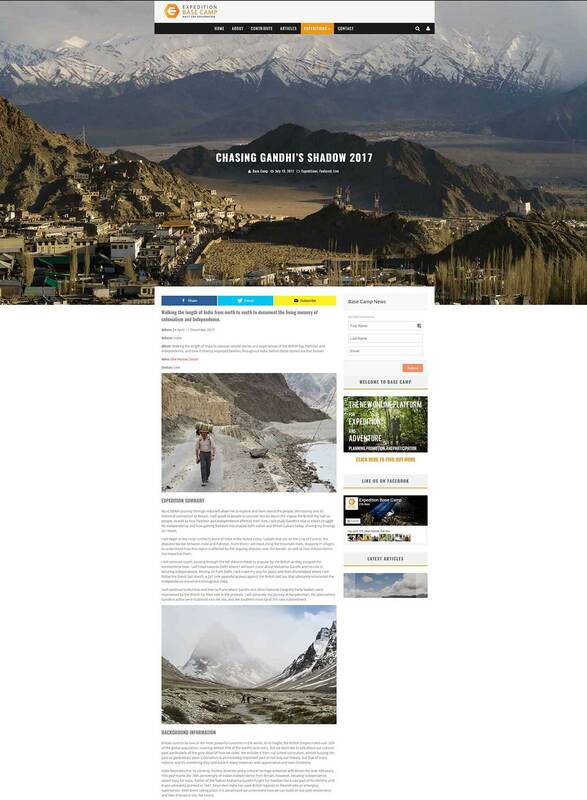 If you have an external website then your page on Expedition Base Camp will drive more traffic to it, and if/when your original website dies, your work and results will still be easy to discover by researchers, the public, journalists, or other expedition teams looking for ideas, contacts, or insights. 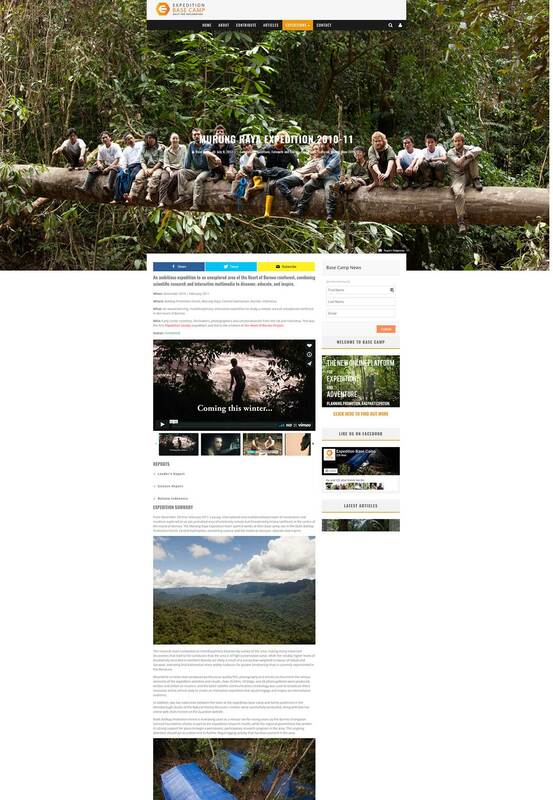 Right now there are around 20 expeditions on the site, six of which are live in the field right now, in India, Mongolia, Costa Rica, Indonesia, Sri Lanka, and Britain, and one of these teams – Expedition Cloudbridge 2017 – is using the site to blog about their expedition. 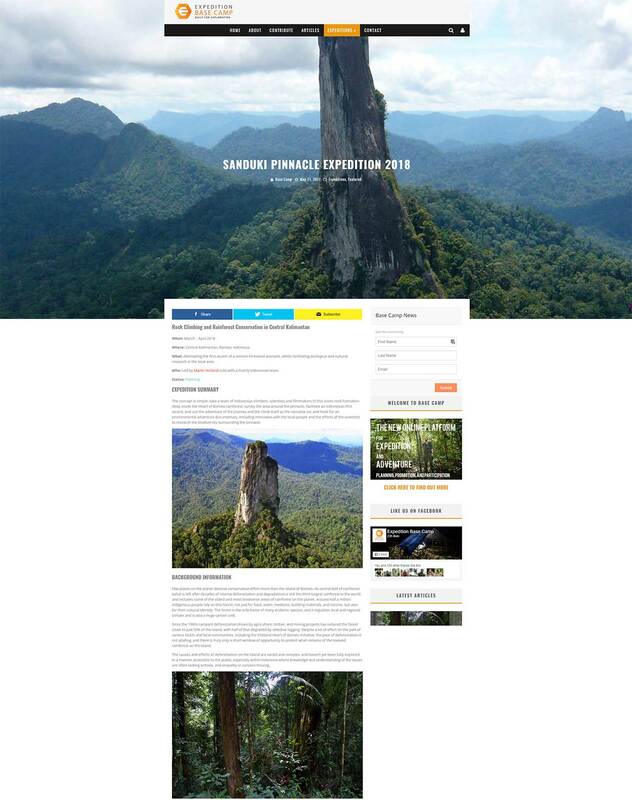 I will be using the site to blog about my upcoming expedition The Broken Roads of Borneo, which is the mountain bike based recce for the Sanduki Pinnacle Expedition. As always I come up with a million other ideas that could be built around this core element of the site: a jobs board, a forum, articles, advice, a grants database. All good ideas, but the core is this platform for expedition teams to increase the reach, impact, and legacy of their work, and that’s what I’m focusing on at the moment. So what is Expedition Base Camp not? Well, it’s never going to replace the RGS database, with close to ten thousand entries spanning decades, but it can work alongside it, contributing to it and complementing it. I would like to start giving expeditions from the pre-internet years a new lease of life by helping those teams digitise their work and profiled on Expedition Base Camp, something which the RGS database will make possible but could never achieve in its current incarnation. 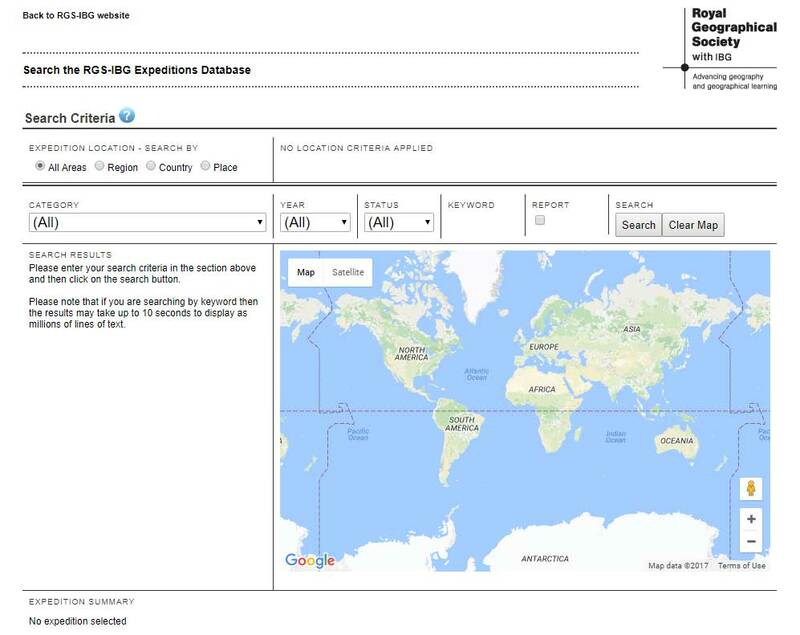 Meanwhile, over 50% of the expeditions submitted to Expedition Base Camp were not already in the RGS database, which suggests the site can help capture an enormous number of expeditions for the RGS. It’s not a repository for first ascents, fastest crossings, weirdest descents, or things like that. Platforms like Pythom and Explorers Web have that pretty much covered. And of course there are thousands of sites dedicated to specific sports, locations, and disciplines, which will serve those niche communities far better than Expedition Base Camp ever could. It’s not a platform for the ever-growing world of adventure. Again, this is a very well served community: in the UK for example Belinda Kirk has built the excellent Explorers Connect into a thriving online and offline community for the adventurous minded, and this is a great place for people to find team mates and share adventure trip reports. Of course there will be some overlap with all of these communities. Trying to define adventure, expeditions, or exploration is basically impossible, but broadly speaking Expedition Base Camp is reserved for what we might try to define as exploration: difficult and unique journeys that bring back news from distant lands. For bonus points, there should be some wider purpose or impact behind the journey. Would a fastest crossing of Greenland make it on to Expedition Base Camp? No. But would a crossing that tried to follow in the footsteps of some early explorers, documenting the changes to the landscape brought about by climate change? Yes, absolutely. These aren’t normal times. Our planet is changing before our eyes. Climate change, pollution, habitat destruction, the extinction crisis and the homogenisation of human culture is devastating the only home to life that we know. In the words of Bruce Parry, the world is not simply a playground, and those of us who feel drawn to explore it have a duty to try to protect it. And if that sounds judgemental or moralising, I don’t mean it to. I certainly don’t judge people who want to push themselves and the latest technology by pursuing objectives purely to see what’s possible. 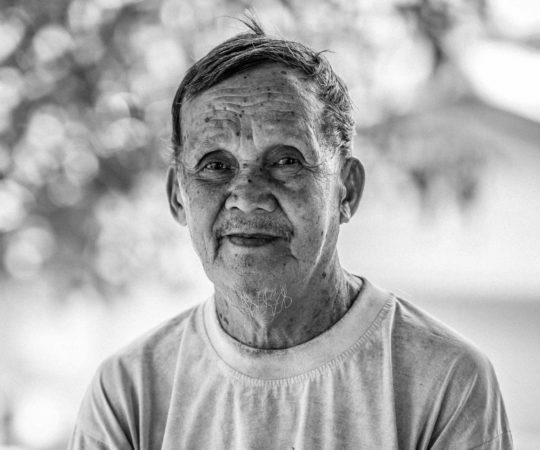 I have this drive myself and I’m inspired by the people who achieve the seemingly impossible. It’s also where the sparse and unevenly spread money and fame afforded to ‘explorers’ is to be found, so it’s always going to be an attractive path. But there is already huge coverage and countless platforms for these kinds of endeavours, while there wasn’t really a platform dedicated to more useful, meaningful projects – projects that have communicating their findings with the public at the heart of their objectives. Well, there is now, and perhaps it will inspire more of the extremely talented men and women in the expedition and adventure world to tackle challenges that help to understand and protect our natural world, instead of merely conquering it in ever more imaginative ways, and it might nudge some of the next generation of explorers to fight the good fight. Oh, and the best part, it’s totally free to use! So if you have been or are about to be involved in an expedition that you would like to add to Expedition Base Camp, simply go here and fill out the form, or let me know if you’d like to help me develop the site.